Dice are cubical or cuboidal shape objects containing numbers/figures/symbols/embedded on their surfaces. dice are used for gambling and non-gambling purposes likes craps, ludo etc. Die/Dice is/are a three-dimensional figure with each of its six sides/faces showing different numbers/letters/colurs etc. It has 8 corners and 12 edges. In a dice, length, breadth and height all are equal to each other. 1. 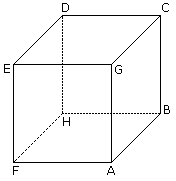 There are 6 faces in the cube – ABCG, GCDE, DEFH, BCDH, AGEF and ABHF. 2. Always four faces are adjacent to one face. 3. Opposite of ABCG is DEFH and so on. 4. CDEG is the upper face of the cube. 5. ABHF is the bottom of the cube. There are certain rules with the help of these rules question on dice can easily determined. Two opposite faces cannot be adjacent to one another. Two different positions of a dice are shown below. Which number will appear on the face opposite to the face with number 4? Faces with four numbers 6, 2, 5 and 3 are adjacent of to the face with No. 4. Hence the faces with no. 6, 2, 5 and 3 cannot be opposite to the face with no. 4. Therefore the remaining face with no.1 will be the opposite of the face with no. 4. If two different positions of a dice are shown and one of the two common faces is in the same position then of the remaining faces will be opposite to each other. Here in both shown positions two faces 5 and 3 are common. The remaining faces are 2 and 4. Hence the number on the face opposite to the face with number 2 is 4. If in two different positions of dice, the position of a common face be the same, then each of the opposite faces of the remaining faces will be in the same position. Here in both positions of common (3) is same. Therefore, opposite of 5 is 6 and opposite of 4 is 2. If in two different positions of a dice, the position of the common face be not the same, then opposite face of the common face will be that which is not shown on any face in these two positions. Besides, the opposite faces of the remaining faces will not be the same. Here in two positions of a dice the face with number 1 is not in the same position. The face with number 6 is not shown. Hence the face opposite to the face with number 1 is 6. Besides the opposite face of 3 will be the face with number 2 and opposite face to face 5 will be the face with number 1. LearnFrenzy provides you lots of fully solved Dice Questions and Answers with explanation.